Imagine you would want to book a holiday. Or maybe you have already booked one and want to look for experiences you could do on your vacation. You would start with searching online for a good fit for your needs and wants, which we all know, can be very time consuming, because there is just too much information and too many options to choose from. When you finally make a decision and actually go on that holiday and experience the destination, would you want to revisit or promote that certain destination to your friends and family? The answer to that question is often influenced by a concept called destination personality. It suggests that every place has a certain personality, meaning that human personality traits can be applied to any destination. If your experience on your holiday was great and even better than you expected then the personality of you and the destination are probably in line with each other. Otherwise, a little less satisfying experience might indicate that there is no good fit between the personality of the destination and your own personality. Therefore, the concept of destination personality serves as a connector between tourists, travel brands and places. It can be used to improve the customer experience and enhance revisiting intention and promotion behaviour, because if the destination you visited fits you well, you are more likely to have an extraordinary experience, come back again and tell all your friends and family all about it. Hence, a possibility for smart marketing for travel destinations emerges out of this concept. By knowing exactly the personality of a destination, a marketing plan can be created, which targets the right customers with a fitting personality. Especially in this overload of supply and demand, it is essential to get through to the customer, who is most likely to look for that exact destination. In order to be able to make a connection based on personality, the destination personality and the customer´s personality have to be measured and identified. The OCEAN (Big 5) Model is used to explore the human personality of the tourists, analysing traits like openness to new experiences or agreeableness. Destination personality is measurable through various scales, which also analyse the different traits. There exist many possibilities in which the concept of destination personality can be put into use. 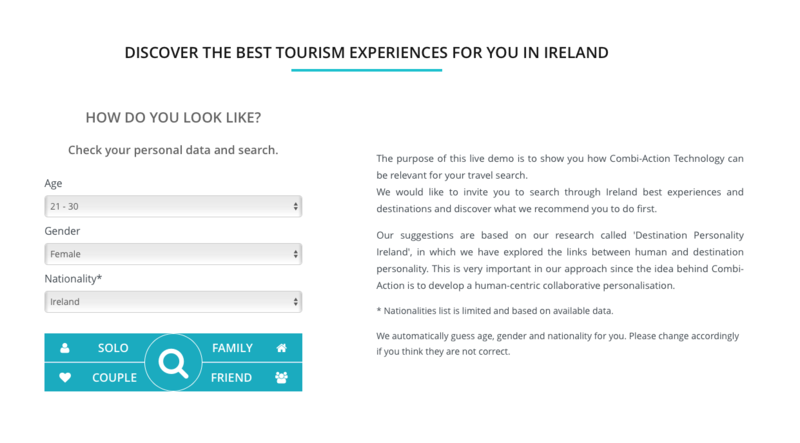 The Dublin-based digital marketing company BSmark conducted a destination personality research for Ireland in 2016, identifying the different personalities of the many tourist destinations in Ireland. With the use of a specially developed toolbox, called MySmark, it is possible to match the destinations with the right tourists. To be more precise, the integrable Combi-Action™ button allows tourists to specify their search preferences by simply providing information about, for example, their reason for travel. Therefore, not only the customer experience can be improved but it is also possible to gain consumer insights for a better targeting. The individually adaptable button could be implemented into various travel agency websites, such as TripAdvisor, improving the customer experience tremendously. Now imagine the same scenario as in the beginning. You are looking for a nice holiday. But now, with the help of smart tools, which use the concept of destination personality, the options that are presented to you are exactly the experiences you have been looking for. There is no more searching for your holiday for hours and hours. And when you come back from your journey you want to revisit and promote the destination to your friends and family. Thus, the concept of destination personality is of great value for travel agencies as well as for destinations. Improving marketing activities and using destination personality for smart marketing makes it possible to exploit the full potential of every destination and target the right customer.